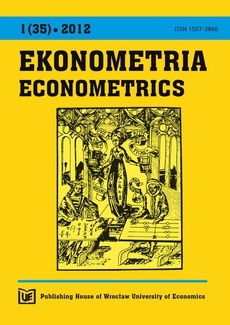 The thirty-fifth issue of Econometrics magazine contains five articles. The first of them by Zofia Rusnak is dedicated to identifying the determinants of poverty, to estimation and comparison of poverty spheres in regional approach by means of selected poverty indicators. Iwona Skrodzka in her article presents the results of research on the relationship between human capital and economic development level in Polish regions. The next article is related to the problem of modeling the marketing research efficiency based on a theoretical description of the GMREM model. This paper was written by Peter Tarka. Aneta Włodarczyk, and Agata Mesjasz-Lech have reviewed the chosen statistical tests which verify the Efficient Market Hypothesis in a weak form. The authors used the tests to verify informational efficiency market issues at the Polish Power Exchange. Grzegorz Michalski, and Alexander Mercik presented in their article how decisions about liquid assets management strategy influence the risk of the organizations and its economical results during realization of main mission.